The elegant Duravit 2nd Floor wash basin, half columns, standing columns, toilets, bidets and cisterns are characterized by flat and inviting shapes and are available in numerous sizes and variants. 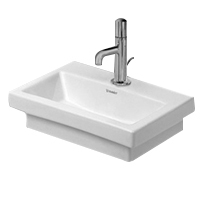 Duravit 2nd Floor fits into the whole house, regardless whether it is an attractive Duravit 2nd Floor double wash basin for the family bathroom, or a small Duravit 2nd Floor hand wash basin for the guest toilet. Everything that is allowed is possible for the WC and the bidet. Do you prefer a Duravit 2nd Floor wall hung toilet with cistern or rather a standing bidet and WC for a wall-mounting cistern? No matter which Duravit 2nd Floor WC you choose, the right Duravit 2nd Floor toilet seat certainly includes the SoftClose function.